Carpal Tunnel Syndrome (CTS) is the most common nerve compression disorder of the upper extremity in working adults in the U.S. Caused by the repetitive use of the hands and wrists, the symptoms of CTS, pain, tingling and numbness in the fingers or hand combined with weakness in the hand and a tendency to drop objects, can make continuing to work in a job role that requires manual dexterity difficult, with 18% of workers who develop CTS leaving their job within 18 months. The symptoms of CTS are caused by compression of the Median nerve as it passes into the hand. The Median nerve is located on the palm side of your hand, also called the carpal tunnel, and provides sensation to your thumb, index finger, long finger, and part of the ring finger. It also supplies nerve signals to the muscle going to the thumb. What Are The Treatment For CTS? steroid injections into your carpal tunnel area to reduce inflammation. The surgical option is one of the most common surgeries performed in the U.S and involves cutting the band of tissue in the wrist that crosses the Median nerve so as to lessen the pressure on the nerve. 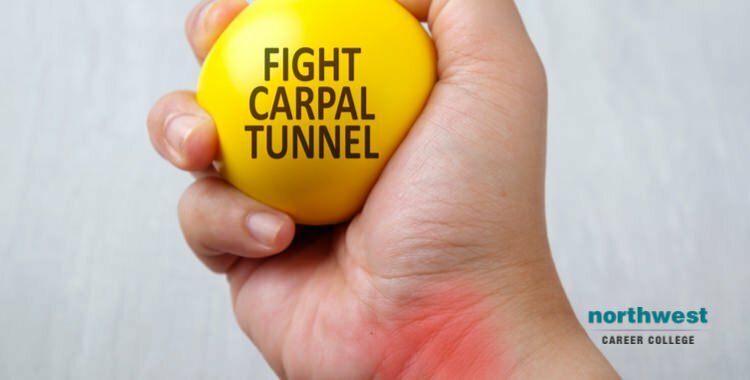 While a surgical remedy for CTS is common, with 463,637 carpal tunnel releases performed annually, it is not without its drawbacks. Post-CTS surgery, 10-30% of patients have reported wrist strength complications while 10-15% of CTS surgery patients change jobs after the operation. Many patients have had success using massage as a treatment for Carpal Tunnel Syndrome. Massage helps relieve the symptoms of CTS by helping break down scar tissue and reducing swelling in the muscles of the wrist and forearm, caused by damage or overextension in the work environment. By restoring the arm muscles to full flexibility, the wrist is allowed to move freely reducing the pressure on the inflamed areas. By massaging and stretching the tendons in the wrist and arm, an experienced massage therapist can reduce the pressure these tendons are putting on the Medial nerve, which in turn reduces the pain and inflammation associated with CTS. At Northwest Career College, we operate the best Massage Therapy School in Las Vegas and our Massage Therapy Program will teach you the skills you’ll need to apply the benefits of sports massage, medical massage, shiatsu and much more. The benefits of massage therapy are widely recognized with employment for massage therapists expected to increase by 22% between 2014-2024, with an average massage therapist earning $39,360 a year. Additionally, many massage therapists maintain active, private practices as well increasing both their flexibility and earnings. Our massage student clinic is open seven days a week, for both your and your clients’ convenience, and we offer day and night classes to accommodate your work and family schedules. Our instructors are experienced professionals who will prepare you to sit for either the NCBTMB (National Certification Board of Therapeutic Massage) or the MBLEX (Federation of State Massage Therapy Boards) exams and we are proud of our 100% board pass rate. Call us at (702) 403-1592 to speak to one of our enrollment specialists today! Barbara Alcaraz, M.A., B.A., L.M.T.